Lentils are a versatile and filling source of vegetable protein. There are many types from the posh Puy and beluga lentils to the cheap-as-chips supermarket staple, red lentils. 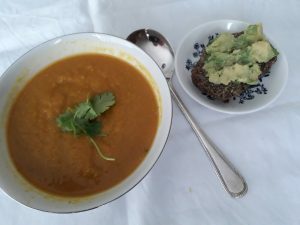 These recipes for lentil soup, stew and curry are very easy to make and use inexpensive ingredients; they are ideal for anyone looking for tasty, inexpensive and healthy meals. They don’t take long to prepare or need much experience of cooking. As a bonus, you’ll have the the satisfaction of feeding yourself and your friends well for very little money. If pulses make you “windy”, rinse them well; the addition of the lemon juice and tomato helps to makes them more digestible. Or you can add a piece of kombu, a dried seaweed that you’ll find in health food shops. Cut off a piece about 2.5cm/1 inch long and cook with the lentils. It can be mixed in and eaten as part of the dish to give added minerals, including iodine, essential for thyroid function. Asfoetida is a spice used in India to aid the breakdown of beans and lentils; find it in the spice section in supermarkets. Add one to two teaspoons with the other spices to aid digestion. Metabolic Balance® followers, you can easily adapt the recipes to fit with your personal food plan. It is handy to have a food processor or hand blender for this recipe, but not essential – you just have to chop the vegetables more daintily. Preparation: If you have a food processor or hand blender, you can chop the vegetables into big chunks. If you don’t have a blender, aim for daintier pieces. Gently heat the oil in a large pan and add the onions. Sprinkle on the spices (coriander, turmeric and asfoestida). Cook for 3 minutes or until the onions have softened but not browned, stir a few times.Stir the carrots and celery into the spicy onion mixture and cook gently for another 2 minutes. Add the lentils and ginger. Stir well to mix all the ingredients together. Pour in the stock, add the tomato puree, and stir again. Bring to the boil, stir, then reduce the heat and simmer for 30 minutes, or until the lentils are soft and mushy; the vegetables should be cooked by now. Add the garlic and fresh coriander/parsley (if using). Allow the soup to cool slightly then liquidise in a food processor or use a hand blender (you can transfer the soup to a large jug to do this or liquidise while still in the pan; beware of splashes!). Add the lemon juice and a shake of black pepper and serve. In the unlikely event that there is any left over, this soup will keep in the fridge for 3 days. Follow the recipe for lentil soup but add less liquid – ½ a litre/1 pint should be about right – to make a thick lentil stew. There’s no need to liquidise the mixture which thickens magically as it cooks. Just make sure it doesn’t boil dry and add more liquid if needed. This stew is good with rice or a jacket potato and green salad.